Have you ever want to move from your current city that you live now? I know, it seems silly. I was born in Jakarta, live for all my life in here. Where any part of the world will accept me? Hahahaha. I used to like Jakarta, but now it’s seems more crowded. Traffic jam, pollution, criminals, you name it. I think it’s seems that I don’t enjoy myself living in here. All I can do is just doing routine and I don’t feel relax. Speaking of relax, last week I got invitation from my aunt. She had her 50th years old birthday. And her siblings made a surprise for her in her new house in Sentul. Instead of surprise party for her, I think the guests were having a bigger surprise. When we stepped into the garden, we could see a big building with majority of glass as the window. With beautiful land contouring, I can tell this is a beautiful house. From the top of the house, there is an infinity swimming pool. We had a pool party. 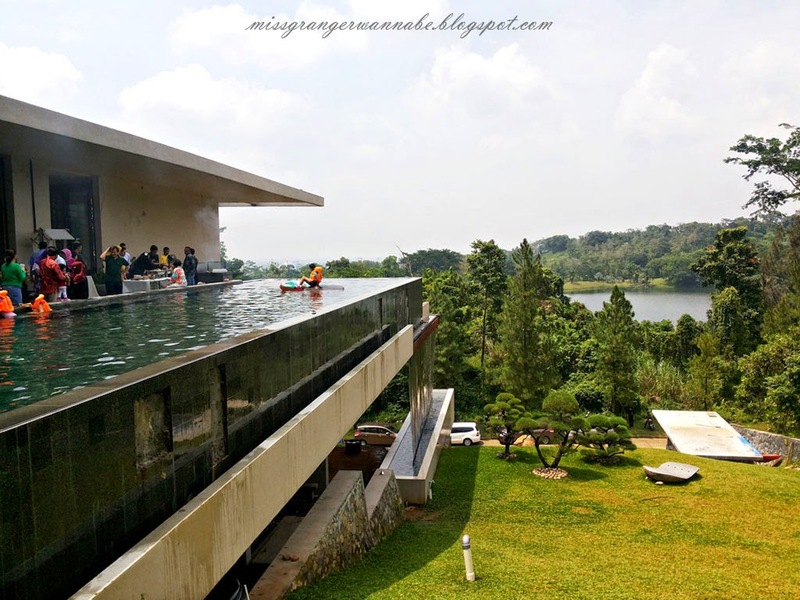 So you can swim or just chilling while enjoying the scenery of Sentul City. Just take a look at the picture! My sister couldn’t stop saying, “this is my dream house, this is it!”. Well, for me the big house is not my type. But the scenery in here is very magnificent. Instead having a big house, I’d prefer to have a house with mountain scenery. I don’t mind if the house is very small. I hope I can still hear the sound of river or enjoying rain under my patio. Having many kittens will be great too! Hahaha seems like I am a country girl. I posted the scenery on my Path. And many friends told me it was impossible for people like us (read: workers) to have a house outside Jakarta. We need to spend more time on the road and it will give you a massive headache. Well, I know it’s just a dream, but I hope I can live somewhere like with this beautiful scenery. This post is for English Friday Weekly Challenge with the theme: Snap and Tell a Story!